The Dell EqualLogic PS6110XV SAN Storage Array is ideal for high performance requirements in mission critical applications at any SMB or IT Professional’s datacenter! This ultra fast storage array network comes standard with 15K RPM SAS Hard Drive across 24 Bays, making for up to 14.4TB of super fast storage. Additionally, connectivity is also fast on the EqualLogic PS6110XV with the redundant dual port 10GbE controllers and 8GB of cache per controller. 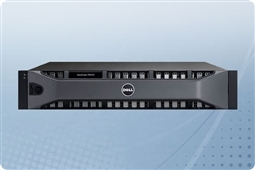 That and more makes the Dell EqualLogic PS6110XV a perfect fit for the most demanding and enterprise level virtualization or application data storage workloads! Aventis Systems offers a 3 Year Essentials warranty on all Dell EqualLogic PS6110XV SAN Storage Arrays with optional Secure Drive, Extended, Express, and Onsite warranty upgrades. So shop below and find the perfect EqualLogic PS6110XV SAN Storage for your most mission critical datacenter or virtualization application workloads today! Curious if the Dell EqualLogic PS6110XV SAN (Storage Area Network) arrays are right for your business continuity and budget? Check out our Survival Guide: Avoiding A Data Apocalypse today! 3.5TB (24 x 146GB) 15K 6Gb/s SAS 2.5"